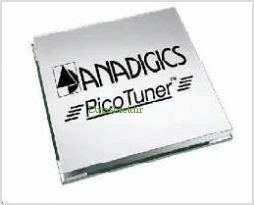 The AIT1005 PicoTuner is a complete integrated data Tuner that includes all the necessary RF Tuner front end circuitry for cable modem applications. The AIT1005 combines GaAs and Silicon CMOS technology - which include the UP Converter down converter and dual synthesizer circuits - along with a SAW Filter VCO tuning circuits, and passive components, to facilitate a complete double conversion Tuner architecture. The AIT1005 is offered in a 40 lead package and requires one +5V supply, plus a low-power +28V supply for varactor tuning. It is well suited for applications that require complete, low cost, small size, high performance RF modules. By Anadigics, Inc. This is one package pinout of AIT1005,If you need more pinouts please download AIT1005's pdf datasheet. AIT1005 circuits will be updated soon..., now you can download the pdf datasheet to check the circuits!